Quoth the Raven, "We're the Underdogs"
Sports writers have spilled more than enough ink writing about the strange coincidence that regardless of which team wins Super Bowl XLVII this weekend, it will be coached by a man named Harbaugh. Instead of dwelling on this piece of sports trivia, we will instead turn our attention to some other strange similarities between the two cities that the competing teams call home. Both Baltimore and San Francisco are historic seaports due to their prime locations on a natural harbor. Baltimore is just upriver from the Chesapeake Bay in the East while San Francisco is forms one side of the mouth of the eponymous San Francisco Bay. As a result of their proximity to the two largest estuaries in the country, both cities have excellent seafood. The specialty in Baltimore is of course the crab cake while San Francisco is known as the birthplace of cioppino which was created by the large numbers of Italian fishermen who settled in San Francisco during the 19th Century. Speaking of Italians, it is also notable that former Speaker of the House, Nancy Pelosi was born in Baltimore where her father was Mayor but now represents San Francisco in Congress and is the first woman and the first Italian-American to serve as Speaker of the House. Depending on where you're from, the term "Bay Bridge" may have a different meaning. In California, the San Francisco-Oakland Bay Bridge is infamous for having partially collapsed during game three of the 1989 World Series and is in the process of being replaced to avoid a repeat performance. In the Mid-Atlantic region, the Chesapeake Bay Bridge is equally infamous as a constant source of traffic delays, numerous fatal accidents, and persistent structural problems. Both are suspension bridges and prior to 1964, both bridges carried U.S. Route 50 from sea to shining sea, although today Route 50's western terminus is now in Sacramento. The wise should avoid both bridges during the big game, just to be safe. In addition to these geographic similarities, the cities are associated two of America's greatest men of letters. Edgar Allan Poe, who has been called the father of detective fiction and the master of the macabre, died in 1849 at the age of 40 under strange circumstances in Baltimore. The Balitmore Ravens are of course named after Poe's most famous poem. In keeping with the pervasive succession of tragedies in Poe's short life, he was paid only $9 for its publication. The year of Poe's death was also the height of the gold rush that gives the "Forty-niners" their name and some 15 years later, a young journalist and jack-of-all-trades named Samuel Clemens moved to San Francisco after having failed as a gold prospector. It was during this time that Clemens wrote a short story titled, "The Celebrated Jumping Frog of Calaveras County" under his pen name, "Mark Twain." This was his first major success and marked the start of a very long and brilliant career. Despite these many similarities, "The City by the Bay" has always been more appealing in the public imagination than the so-called "Charm City." San Francisco conjures up images of flower-clad hippies, quaint cable cars, and the yeasty aroma of fresh-baked sourdough bread. Meanwhile, the biggest claims to fame for the city of Baltimore are a crime melodrama called "The Wire" and a show about cakes that don't look like cake. Even though it has been nicknamed "Fog City," most outsiders think of San Francisco as a sunny and cheerful place--which is most certainly is not. As Mark Twain famously never said, "The coldest winter I ever spent was a summer in San Francisco." On the other hand, Baltimore's reputation as a gritty post-industrial wasteland is thoroughly well-deserved. Perhaps this explains the map above. A survey of Facebook users' personal preferences shows that the San Francisco Forty-niners are the clear fan favorite this weekend while the Ravens enjoy only slim support along the Eastern Seaboard. 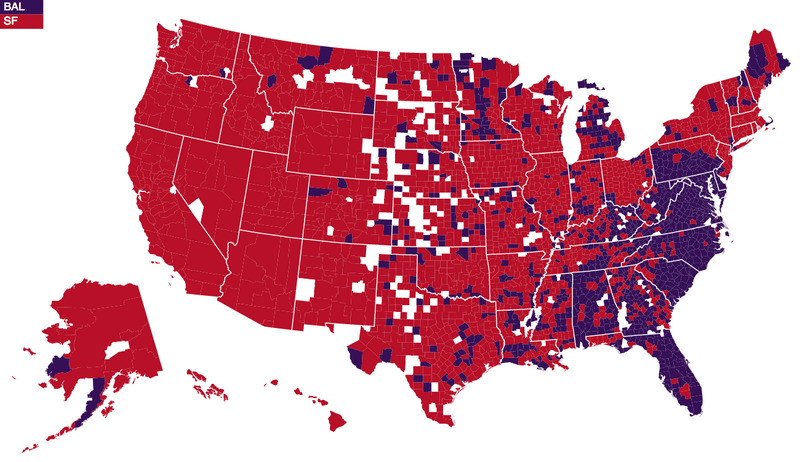 Indeed, the only states which are solidly rooting for the Ravens are Maryland and Delaware. Every other state has at least one county rooting for the 'Niners and in all but a handful, San Francisco fans are in the majority, although most are admittedly of the fair-weather variety. Fortunately the Super Bowl is being held at an indoor stadium this year. Saint Paul is no ordinary saint. Unlike much of the New Testament which was passed on through oral tradition by the apostles before being written down, we know with complete certainty that Paul's epistles were written during his life by his own hand--the same hand which had formerly whipped and shackled Christians. Aside from the divine figures of the Holy Family, Paul is arguably the most important figure in all of Christianity. 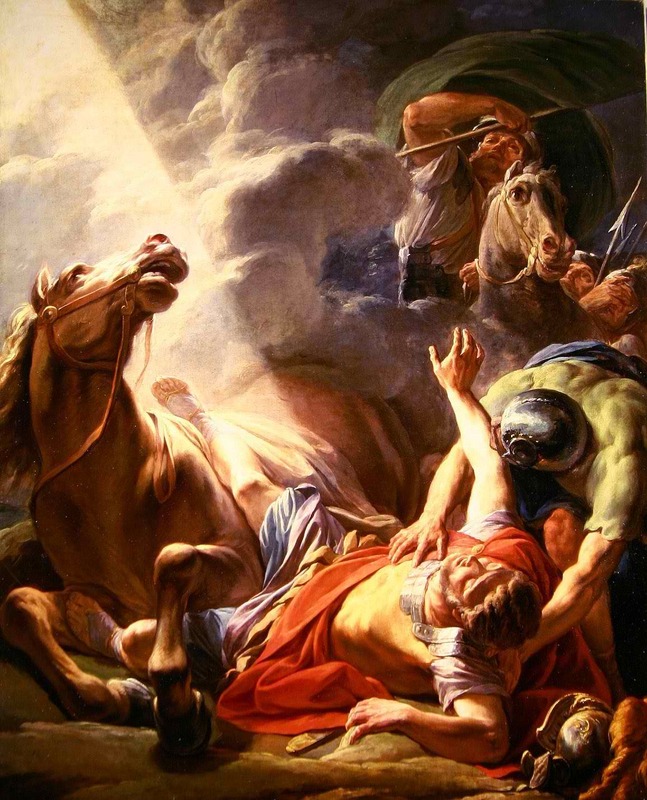 As a convert, the Prolix Patriot has a special fondness for Paul's story because he shows us that it is never too late and no sin is too great when we come to that place on the road to Damascus in our own lives. It is fitting then that in addition to the Feat of the Conversion of Saint Paul, today is also the March for Life in Washington, D.C. and many of the Prolix Patriot's dear friends will be there braving the bitter cold as witnesses to Jesus' triumph over death. The most heartbreaking and yet awe-inspiring point in the March for Life is always the women who have had abortions, but have since then come to regret that "choice" as it is so often euphemized. Like Paul, they have been stopped dead in their tracks and blinded by God's awesome love. Like Paul, these women have realized that even they can find forgiveness and hope. Their courage to speak out against abortion from personal experience is a testament to the eternal power of life over death and the victory of love over sin--and this testament must also stop us dead in our tracks as well. Relatedly, in our national discourse we are called to consider the essence of womanhood by the Obama Administration's recent decision to allow women to serve in combat duty. Women have been endowed with the incredible power to participate in the creation of life. Just as we pray for conversion of those who have had abortions or are contemplating one, we also must pray that women can always be protectors of life--and perhaps even in the heat of in battle as medics or corpsmen--but should never be destroyers of life. It is bad enough when mothers must bury their sons as casualties of war, but a son should never have to bury his mother because of the enemy's bullet. We live in times of persecution for people of faith, but Paul reminds us that even the persecutors themselves are nevertheless called by God's infinite love to righteousness just as the most devout believers are called to continuing conversion of heart to more fully emulate Jesus and to spread the Gospel. We must remember that Jesus in all of his dreadful power was born of a woman just like the rest of us. As a consequence, a proper respect for the protective and live-giving qualities of womanhood is essential if we seek to know the heart of Jesus. Even though Dr. Faust is a fictional character, we know from the example of Saint Paul that even a man who sold his soul to the Devil would still be able to repent and seek God's eternal mercy. Like Saint Paul, we are all living in blindness, but no matter how great our small our sins, we are all on the road to Damascus and Jesus is calling us. The Prolix Patriot recently relocated from his beloved native Virginia over the mountains to the Buckeye State of Ohio. 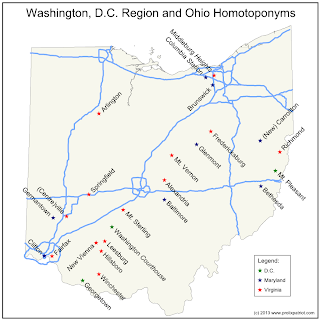 The map above illustrates a selection of some of homotoponyms as well as a few synotoponyms from the greater Washington D.C. metropolitan area. The list is by no means exhaustive, but at first blush, it seems that Virginia especially has the most names in common with Ohio and this is for good reason. 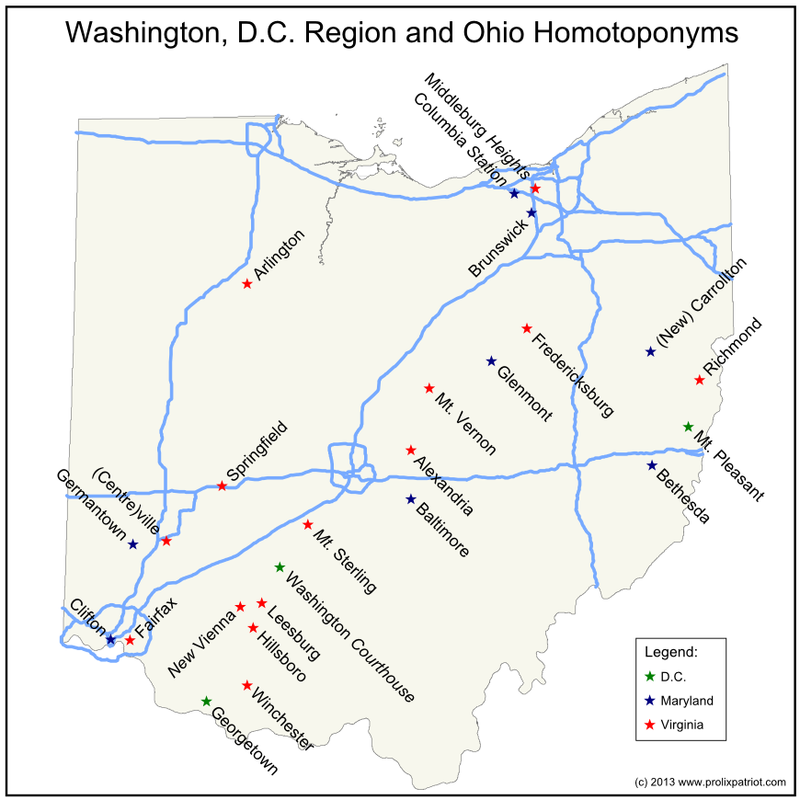 After the Revolutionary War, much of Southern Ohio was settled by soldiers from Virginia, so it is no surprise that they, like the Prolix Patriot, would have chosen familiar place names to remind them of home. The two states have much in common besides just place names. Both states are also nicknamed "Mother of Presidents." Virginia is the birthplace of no fewer than eight presidents. Meanwhile, Ohio is the birthplace of only seven, but claims an eighth as a native son. William Henry Harrison, who famously served as president for only 30 1/2 days was born in Virginia but also considered Ohio his home state. Ironically, his successor was John Tyler, a Virginian. Despite their reputations, the last president born in Virginia was Woodrow Wilson, born in Staunton in 1856, although he called New Jersey home when elected. The last president born in Ohio was Wilson's successor, Warren G. Harding, born in Blooming Grove in 1865. In more recent times, Virginia has joined Ohio as a pivotal battleground state in national politics. Both Virginia and Ohio are now must-win states for any candidate seeking the presidency. From an economic standpoint, both Virginia and Ohio have a major industrial and shipping hub (Norfolk on the Chesapeake Bay and Cleveland on Lake Erie), a largely rural agricultural region (Tidewater Virginia and Northwest Ohio), a centrally located state capital with historic industry related to some vice (Tobacco in Richmond and Breweries in Columbus), an historic canal terminus and port located on a major river (Alexandria on the Potomac and Cincinnati on the Ohio), and finally a mountainous area rich in natural resources and wildlife, but generally regarded as the poorer part of the state socio-economically (Appalachian Virginia and Southeastern Ohio). In some ways, the Prolix Patriot is still right at home.